communicate is the obvious fact that I am a human being who has his own personal preferences, just like anyone else. There are some things I like, and others that I don’t. KAT: Friends, readers, earthmen, lend us your eyes for another Culture War Correspondence. This week Evan and I will be discussing Jennifer Lawrence. It may sound like a broad topic, but maybe Evan can expand for us why she recently came to his attention. But before we really delve into all of that I think it’d be good if we both answered the question: How do you feel, generally, about Ms. Lawrence? KAT: Well, I’ve written about her in the past and my opinion tends to be generally the same. She seems authentic to me, and while I realize no one can be truly authentic in the public eye, I enjoy seeing a celebrity in the news that I can relate to. I’ve been meaning to write this post for some time now, however, a picture I recently saw finally gave me the push I needed to actually get down to it. 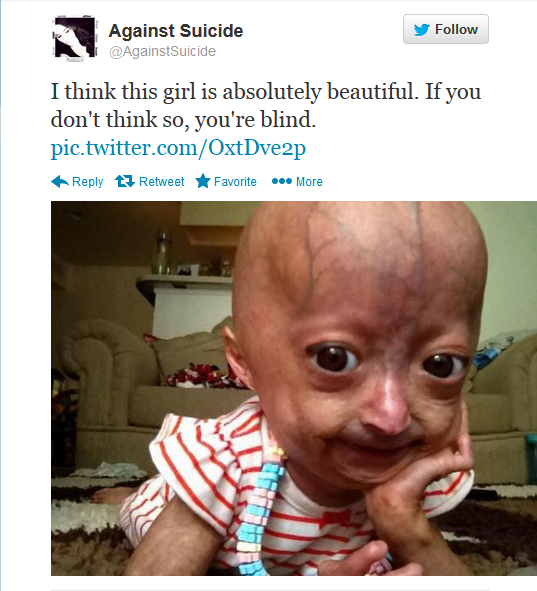 Readers, Adalia Rose is not beautiful.